As I sat in bed, my TV screen staring blankly at me, I flirted with the idea of whacking on a thriller. The Invitation volunteered itself to be that thriller. 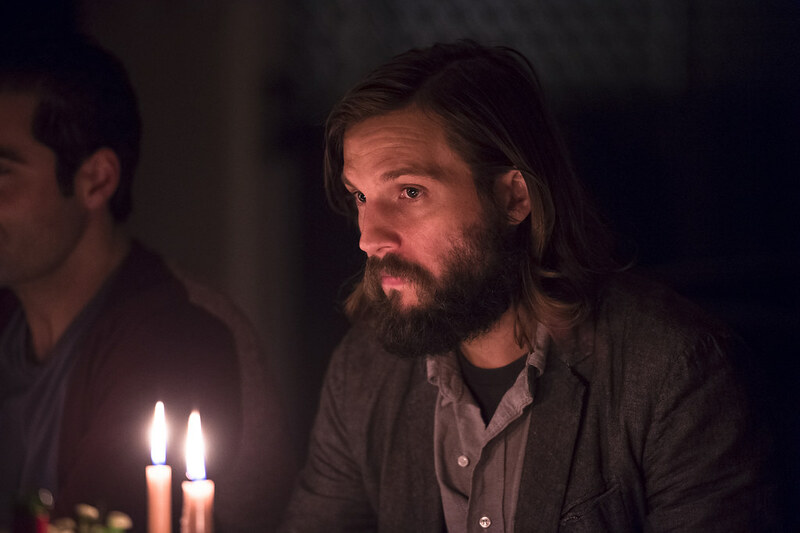 The Invitation gives itself an interesting concept and wastes little time in dashing it against a wall. From the off the group of friends seem like strangers handed a script and told to get on with it. There is only a spark of any sort of relationship between Will and Eden, with their history together receiving the flashback treatment whenever Will had a wobble. The group doesn’t talk like old friends but co-workers trying to make a good impression. There doesn’t seem to be a genuine friendship anywhere. The overall tone of the film is monotonous and repetitive. The audience views the events that occur through Will’s heavily paranoid eyes and his (and the film’s) mood is unchanging. It’s a constant cycle of ‘hmm, something’s going on here’ and ‘oh no he’s just paranoid’. Sometimes the audience is treated to a sprinkle of ‘maybe they’re just odd’, but besides that there’s nothing else. Some people have instead called this a ‘slow burner’ but if your film takes 65 minutes out of 90 to deliver its climax, it’s just painfully slow. The film also features some questionable decisions. In the first third of the film, Claire (Marieh Delfino) becomes uncomfortable and is eventually allowed to leave. Upon getting in her car and preparing to go, Pruitt (John Carroll Lynch) calls her name and she stops. It’s left unknown if anything sinister happened or whether she safely left as we never return to this again. Claire is the least used character in the film and so I was left uncaring if anything happened to her. What I did want to see was something come of this moment, as Will watches the scene unfold from the window. But he doesn’t do anything more, despite finding everything that’s happening is weird and being worried for her. As the film reaches its climax, Will erupts and demands to know where apparent late-comer Choi (Karl Yune) is. He cites a delayed voicemail he’s just got (due to the bad signal) as reason for the outburst. It’s a nice moment and all involved give a decent performance. But suddenly Choi walks in! He tells the group that work called him in and that’s why he vanished. But why didn’t he phone Will again and tell him? After being reduced to embarrassed and guilt ridden tears, Will looks set to just get on with the evening. Eden and David then bring out some drinks and Will, rather skilfully, smashes about five in as many seconds. It’s revealed the drinks were poisoned as Choi’s girlfriend Gina (Michelle Krusiec) succumbs to the poison. Chaos ensues as Pruitt and David start trying to kill everyone. Turns out the cult planned a group suicide so they could go to the ‘better place’ their cult leader promised them. Will, his wife and one half of the gay couple survive the onslaught and it’s revealed that every house around them has committed the same deed. This is signified by a lamp David lights earlier. It’s a nice shot and a nice twist that ends the film. The film has some pretty shots throughout and does well when it’s allowed to breathe. Marshall-Green delivers an at times good performance and Lynch is unsettling throughout. The pay off, when it eventually comes, is good and provides 20 minutes of action. It just took over an hour to get there without anything really exciting happening. It’s a good premise with some nice cinematography but lacklustre writing and acting drags it right down. It was an invitation I wish I turned down.